All experts and firearms enthusiasts agree that Remington 700 is one of the most successful rifles ever introduced on the world. Accurate, rugged and dependable, the Remington rifle has spawned a lot of variants for militancy as well as civilian uses. In the case you are new to bolt action rifles, there are 2 variants of Remington 700 that you definitely need to check out: ADL (A Deluxe) and SPS (Special Purpose Synthetic). Wonder who would come out on top in a Remington 700 ADL vs. SPS competition? Then this article is for you. Down below, you would be introduced to everything you need to remember about the ADL and SPS variant of Remington 700 including their features and performance. Once you manage to grasp what these rifles have in store, it’s not difficult for you to decide which one you should go after. Generally speaking, different shooters would like different qualities and so there is no such thing as the definite winner here. In the end, people have to rely on their own personal preferences and shooting style to make the right call. At first, Remington produced 2 variant of the Model 700: ADL (A Deluxe) and BDL (B Deluxe). For a time, ADL was the most cost-effective variant in the line of Remington Model 700 but after 2005, Remington 700 SPS quickly took over that spot. While Remington at first decided to completely shelve the production of ADL, the variant makes a come back in recent years as a low-cost option for budget-minded shooters. Compared to original units, new ADL rifles receive some changes here and there but the design is largely the same. As with other variants of Remington 700, ADL rifles are available in a lot of configurations. Namely, you could choose from 10 different models with 3 barrel lengths (20, 24 and 26 inches), 3 magazine capacities (3, 4 and 5), 5 twist rates (1:8, 1:9 1/8, 1:10, 1:12 and 1: 14) and 10 calibers (.243 WIN, .270 WIN, .308 WIN, 6.5 Creedmoor, .30-06 Springfield,…) . Thanks to the wide selection and affordable costs, ADL rifles are well liked by people that have a tight wallet. On average, ADL rifles are cheaper than their SPS cousins by a few hundred dollars. Made to supplement and then replace ADL, Remington 700 SPS is a new design that features new material, trigger and magazine. Overall, the performance of most ADL rifles is highly competitive. Nowadays, both ADL and SPS rifles are in production but the average price of SPS models tend to be higher. That being said, rifles in the SPS line still remain more or less reasonable compared to high-end Remington 700 rifles. As a result, shooters often go for SPS rifles if they like something that possesses quality and have acceptable prices. Regarding available models, Remington 700 SPS provide shooter with nearly 20 choices including 3 barrel lengths (20, 24 and 26 inches), 3 magazine capacities (3, 4 and 5), 5 twist rates (1:8, 1:9 1/8, 1:9 1/4, 1:10 and 1: 12) and 15 calibers (.243 WIN, .270 WIN, .308 WIN, .300 Remington Ultra Magnum, .223 Remington,…). With such a huge number of configurations, virtually any shooter could find a Remington 700 SPS that suit his/her demands. That kind of advantage makes SPS rifles excellent choices for novices as well as veterans. Simply put, ammunition comes in and out in the same manner in a blind magazine. So you could only rack round out of the rifle action one at a time. For shooters that prioritize ease of use, the arrangement is less convenient to reload, especially if they are wearing gloves. In addition to that, there is a chance that you might load the round too far forward/rearward and the result is an annoying jam. 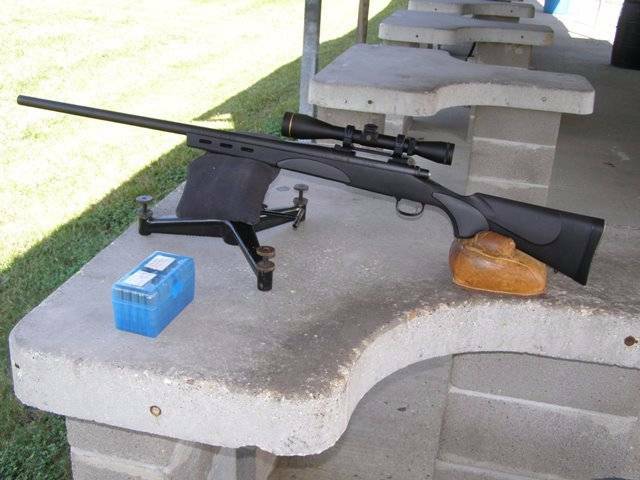 As a result, it’s widely advised that you pay attention and stay concentrated while reloading a Remington 700 ADL rifle. Smooth and stable, the synthetic/laminated stock Remington 700 ADL performs admirably in the great outdoors. Although its material is not top-tier, the stock would hold itself together for a long time on the field. Regarding overall display, the rifle score rather well using the factory stock and that is why there is no need to worry about accuracy drops. But I in the case you want something tougher, there are a lot of aftermarket stocks available for purchase nowadays. All you have to do is to pick one that matches your rifle color theme. While the X-Mark trigger is primarily designed to be adjusted by gunsmith, shooters could change the pull weight on their own assuming that they know what they are doing. The factory setting of the trigger pull is 5 pounds, a bit heavy to some people but feel free to tweak it as you see fit. Besides that, the rifle also features a plastic trigger guard that is somewhat functional but it’s unable to survive significant concussions and rough uses. Fortunately, it’s not difficult to find and secure replacement trigger guards for Remington rifles. Being a free-floated design, the barrel of ADL rifles possesses a superb shooting consistency compared to most classic models. While the life of the barrel varies depending on the choice of caliber, it should at least serve you well for a few thousand rounds. As the twist rate of the barrel largely decide the type of round that the rifle accepts, there are several limitations you have to remember. For instance, a 26-inch barrel chambered in .22-250 Remington with a twist rate of 1:14 only accepts loads that are below 60 grains. All factory-manufactured ADL rifles have a stylish matte black finish covering the bolt as well as the bolt face. After a couple of discharges, the finish on the bolt face should slowly disappear but that is a negligible issue. Generally speaking, the finish is rugged and it would stay intact around for years if you look after your rifle. If possible, always store the rifle in a case and keep it out of harm way so as to extend the longevity of the finish. Of course, in the case the finish wears out, just send the rifle back to Remington for re-finishing works. Similar to blind magazine, hinged magazine is also an internal design but there is a distinct difference: Shooters could unload the rifle through the floorplate. So you no longer have to cycle and eject individual round at the end of a shooting session/hunting trip, simply pop open the floorplate in order to retrieve ammunition. Because of that, hinged magazine is superior to blind magazine when it comes to convenience. Although it’s not as handy as detachable magazine, hinged magazine is a great choice for most bolt-action rifles. As with Remington 700 ADL, Remington 700 SPS also uses an adjustable trigger but the model is newer, the X-Mark Pro. The trigger guarantees minimal creeps and delivers far more adjustment freedom compared to its predecessor. After leaving the factory, the default trigger pull is set at 3.5 pounds and you have 2 pounds worth of adjustment available. Providing that you have no specific need and requirement, a pull weight of around 3 pounds should be more than enough. At that setting, the risk of unintended discharge is fairly low and the trigger remains sufficiently light for quick firing. In line with other Remington 700 variants, SPS rifles boast the iconic twin locking lugs in a rugged circular receiver ring. Assisted by semi-doglegged and flattened bolt knob, the operation of the bolt is straightforward and could handle tough conditions. Additionally, the safety mechanism is still the good old lever that is located behind the bolt handle of the rifle with 2 settings: on and off. While other advanced rifles feature complex designs such as bolt/trigger locks and so on, the venerable safety lever of Remington 700 SPS is well-liked. Equipped with a thick barrel, Remington 700 SPS on average possesses higher than endurance than a lot of its cousins that only have thin sporting barrels. Considering the fact that there are 6 holes on the fore end of their barrel, SPS rifles fare quite well when it comes to repeated firings. Normally, as the twist rate of the barrel decrease, you could use heavier and heavier bullets which improve hitting power. In the case you want to outfit muzzle break and so on, some barrels of SPS rifles come in threaded. Although the precision of a particular firearm relies considerably on the skill of the shooter, Remington 700 ADL is known for being a highly accurate rifle. Regardless of the caliber, ADL rifles could achieve rather tight groupings with factory-manufactured ammunition. At 100 yards and closer, it’s highly likely that the groupings would stay below 1 inch. As the distance increase, your shooting skill should come into play but an average shooter could land round after round on targets with relative ease out to 300 yards or so. Hunters that regularly shoot in the woods consider the precision of SPS rifle to be quite sufficient in most cases. The shot grouping rarely exceeds 1 inch if the range is around 75 yards which is a common distance for visual confirmation. When your surroundings consist mostly of dense branches as well as bushes, it’s unnecessary to bring a rifle specifically built for long range shooting. However, the rifle is able to use lightweight high-velocity rounds too so it could obtain respectable results at extended distances if the need arises. Nowadays, people either purchase an ADL rifle or pay a bit extra to get a scope along with the rifles. In most of the case, the scope that accompanies the rifle is kind of mediocre and so it’s best to only get the rifle. Once you manage to secure the rifle, you could start thinking about the type of scope that match your taste. ProStaff (Nikon), DiamondBack (Vortex Optics) and Rifleman (Leupold) are all excellent choices for a Model 700. It goes without saying that you need to take your shooting purpose into account before deciding on a rifle scope. Thanks to the Picatinny rail, it’s generally a breeze to mount a scope on SPS rifles and secure it. In term of suitable models, there are a variety of options on the market such as CrossOver (LUCID), Buckmaster (Nikon) and Dusk and Dawn (Bushnell ). As the rail of the rifle is forgiving to work with, people could swap the current scope for another at moment notice without much difficulty. Needless to say, whatever rifle scope you choose, take the lens diameter into consideration and then use appropriate mounting rings. Models in the Remington 700 line including ADL as well as SPS have received praises from many shooters around the globe. Nonetheless, at the end of the day, people have conflicting ideas about the best rifle overall, especially when it comes to Remington 700 ADL Vs SPS. So the only way for you to determine the winner in the competition is to use your taste and style. Therefore, crosscheck the things you like/hate with the characteristics of these rifles and you should be able to conclude what rifle to get here. Quick Reminder: There are various methods for shooters to secure quality Remington rifles but if possible, play it safe and order straight from the brand. That allows you to access the post-purchase supports from Remington and in the process avoid third party related troubles. How Durable is Hydro Dipping on Gun?